Tris2-chloropropyl phosphate manufacturers - ZhangJia Gang YaRui Chemical Co., Ltd.
Tris2-chloropropyl phosphate TCPP for soft / hard polyurethane foam, with thermal and hydrolytic stability good, especially suitable for ASTME84 (Level 11) foam, with low viscosity unsaturated polyester resin in low temperature application and phenolic plastics at. This product is also used to grab the foam sealant and sheet production. For polyvinyl chloride, polystyrene, phenolic resin, acrylic resin and rubber, coating, flame retardant, also used for soft and hard polyurethane foam, epoxy resin, polystyrene, cellulose acetate, ethyl cellulose tree and phenolic plastics, polyvinyl acetate and gun type foam sealant production. 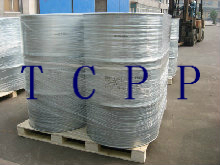 Tris2-chloropropyl phosphate TCPP manufacturers, Flame retardant TCPP supplier is mainly distributed in Jiangsu, Zhejiang, the general price is relatively stable if exports, to US $price exports cheaper! Tris2-chloropropyl phosphate TCPP export market: America, Japan and South Korea, India and other European countries, our company mainly export-oriented, export ratio: 80% export. If Tris2-chloropropyl phosphate manufacturers product is not what you want, we can be customized according to your needs, please send us your order to Email: sales@yaruichem.com , or click here to post your buying lead.